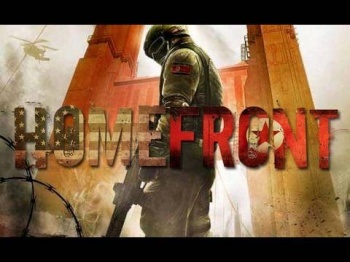 Using the dreaded buzzword "transmedia," THQ announced a tie-in novel for Homefront co-written by the game's author. While the game may not be my particular cup of tea (Earl Grey, hot), I'm actually very interested in the story behind the Korean invasion of America in Homefront. John Milius, the director and co-writer of the 80's Red Dawn, has crafted a bleak picture of the occupation of the U.S. after its military and society are broken by years of economic hardship and political unrest. Today, as part of its grand "transmedia strategy" for the Homefront, THQ announced that a novel penned by Milius and Raymond Benson (veteran of many novels based videogame and movie franchises such as James Bond and Splinter Cell) will be released at the same time as the game. Homefront is due out in March on the PC, the PS3 and Xbox 360. "Homefront represents a fascinating vision of the near future," said John Milius, who I will forever picture as Walter from The Big Leboswki because the Coen brothers allegedly based the character on him. "After completing my work on the game, it became clear that there were many more stories to tell, and this book will offer a chilling look at this near-future world." The story of Homefront seems custom-made for those with interests in alternate history or post-apocalyptia. In 2027, the U.S. is abandoned by all its allies and is therefore susceptible to an attack by a United Korea under the Kim Jong Il's son. The player must join the Resistance and fight guerrilla-style against the invaders in walled suburban towns across the American countryside. "We're delighted to confirm the first element of what will become a vast transmedia strategy for Homefront," said Danny Bilson, VP of Core Games at THQ. "John Milius has already worked with us extensively on the Homefront game, and we're thrilled to have him and Raymond on board as we develop our near-future world into other types of media." Bilson seems to be hinting that this "transmedia strategy" is just beginning. Let me guess, there will be a comic book set in the Homefront universe. Or maybe, an animated short? Action figures? What do you guys think?